This chicken cacciatore recipe comes from southwestern Italy by way of my friend Michelle's Italian grandmother! It's the perfect dish for a Mediterranean diet menu and for all low glycemic diets. Michelle's grandmother grew up in Naples eating chicken cacciatore and then later making it for her family. When they immigrated to the U.S. in the 1940s she brought her family recipes with her. I made one modification to increase the good fats by substituting olive oil for butter. Because this recipe uses olive oil and also skinless chicken thighs (unlike the photo) there's much less saturated fat. It is one of our printable low glycemic index recipes. Heat olive oil in another large pan with high sides or in a 3 quart casserole or saucepan with lid. Season chicken with salt and pepper and brown on all sides on medium heat in small batches. Remove the chicken pieces from the pan when they're done and set aside on a plate. Drain all but 2 tablespoons of oil from the pan. Add the garlic and thyme and sauté until the garlic is soft. Add the chicken back to your casserole with the sherry and tomato juice. Cover the skillet or saucepan and simmer for about 30 minutes, adding more sherry or tomato juice if chicken appears dry. While the chicken is simmering, sauté the mushrooms, make the cacciatore sauce below and cook the spaghetti noodles. Turn chicken over several times while cooking. When it is tender, pour the fresh sautéed mushrooms and olives over it. Cover again and continue to cook about 5 minutes. Heat the olive oil until quite hot; add the onion and the pepper and sauté for 5 minutes. Add tomatoes and seasonings and simmer uncovered for 15 minutes or until mixture is quite thick. When chicken is tender, arrange it on a platter or serving dish and pour any remaining pan juices over it. Cover with sauce cacciatore or serve separately. Serve over Barilla Plus high protein spaghetti noodles. All pasta is low glycemic but high protein Barilla Plus is the best choice because it has the lowest glycemic index. It does combine a grain with protein so it makes a heavier meal. Ideally having it for a noon day meal makes the most sense but if you have kids that's not usually an option. So just have a small serving and eat a lot of salad. It's elegant enough for company or just makes a great family meal. It tastes even better when it's reheated the next night after the flavors have had a chance to blend. This is one reason to keep the cacciatore sauce separate so you can make fresh pasta the next night. 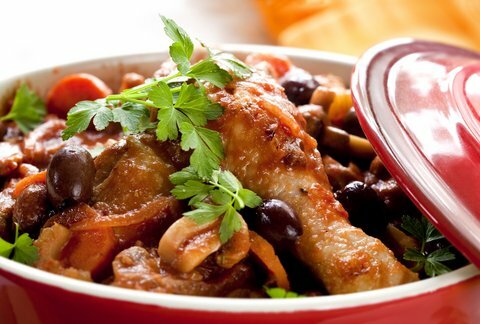 Return from Chicken Cacciatore Recipe to Low Glycemic Recipes. Return from Chicken Cacciatore Recipe to Lifetime Fat Loss home page.